American pikas, the chirpy, potato-sized denizens of rocky debris in mountain ranges and high plateaus in western North America, are holding their own in the Southern Rocky Mountains, says a new University of Colorado Boulder study. Led by CU-Boulder doctoral student Liesl Erb, the study team assessed 69 historical sites known to host pikas in a swath of the Southern Rockies ranging from southern Wyoming through Colorado and into northern New Mexico. The results showed that 65 of the 69 historical sites that had hosted pikas -- some dating back more than a century -- were still occupied by the round-eared, hamster-like mammals, Erb said. The new study stands in contrast to a 2011 study in Nevada's Great Basin that showed local extinction rates of pika populations there have increased nearly five-fold in the past decade. That study, by a separate research group, also showed that local Great Basin pika populations had moved up in elevation nearly 500 feet in the past 10 years, a migration believed to be triggered by warming temperatures. Despite the low number of extirpations, or local population extinctions, in the Southern Rockies, the CU-Boulder team found that the pattern of pika disappearance at particular sites was not random, said Erb of the ecology and evolutionary biology department and lead study author. "The sites that had been abandoned by pikas in our study area all were drier on average than the occupied sites," she said. A paper on the new CU-Boulder study by Erb is being published in the September issue of the journal Ecology. Co-authors include CU-Boulder Research Associate Chris Ray and Associate Professor Robert Guralnick, both affiliated with the ecology and evolutionary biology department. The study was funded primarily by the National Geographic Society. One likely reason for the relative success of pikas in the Southern Rocky Mountains study is that available habitats are higher in elevation and are more contiguous than habitats in Nevada's Great Basin, said Erb. But some climate models are predicting drier conditions in parts of the Southern Rockies in the coming decades as the climate warms, she said. Alpine species are among the plants and animals most threatened by climatic shifts because of their physiological and geographic constraints, said Erb. In 2010, the U.S. government denied endangered species listing for the American pika in part because there was insufficient data on its distribution and abundance across western North America. The American pika lives in mountainous regions including British Columbia, Washington, Oregon, Idaho, Montana, Utah, Wyoming, Colorado, Nevada, California and New Mexico. Surprisingly, most of the pikas that have disappeared from Great Basin sites under study in recent years were from sites that experienced extremely cold temperatures and may be related to a lack of winter snowpack insulation, said Ray, who has participated in several Great Basin pika studies including the 2011 study. Ray suspects pikas may reduce summer foraging activities to avoid heat stress caused by rising temperatures, leading to smaller winter food caches that can't sustain them during extreme cold snaps. Guralnick, also curator of invertebrate zoology for the University of Colorado Museum of Natural History, said pikas are becoming a "bellwether" species for mountain ecosystems, primarily due to their recent Great Basin declines. Prior to the new CU survey, population trends of pikas in the Rockies were relatively unknown, he said. "Many have assumed that warming temperatures would be the primary signal affecting North American pikas," said Guralnick. "This study shows it is more complicated than that, and that drier conditions could affect the persistence of pikas across the West." The CU-Boulder study team initially looked at about 800 historical records of pika sightings in Colorado, New Mexico and Wyoming, but most locations were not specific enough for scientific use. The team eventually narrowed down the historical sites of pikas to 69 specific places known to have been occupied at some point before 1980, using tools like GPS to help pinpoint the geographical accuracy of each individual site. 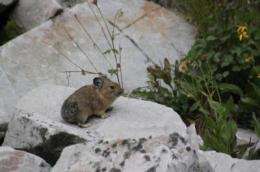 Members of the rabbit family, the conspicuous pikas can be seen scurrying about rocky debris known as talus in alpine and subalpine regions of the Rockies, emitting their signature, high-pitched squeaks. Instead of hibernating, pikas cache huge amounts of plants and flowers known as hay piles under large rocks that sustain them through the long winters. The CU team used data from Oregon State University's PRISM Climate Group to compile local climate information from 1908 to 2007 for the 69 historical pika sites in the Southern Rockies. The information produced estimates of monthly precipitation and minimum and maximum temperatures. The team confirmed the presence of pikas at each site either visually, by their distinctive squeaks, or by evidence of fresh pika hay piles cached under rocks in the study areas. Sites visited early in the 2008 field season that lacked fresh pika signs were revisited in late October and early November for re-evaluation, Erb said. In places where pikas were still absent, researchers searched rock slopes up to two miles in all directions in an attempt to locate pika populations. Volunteers have helped gather similar data on pikas through the PikaNET program, the Front Range Pika Project and the New Mexico Pika Monitoring Project. Such volunteer projects are organized through collaborations between CU-Boulder, the Colorado Division of Wildlife, the Denver Zoo, Rocky Mountain Wild, Colorado State University, the Mountain Studies Institute in Silverton, Colo., the San Juan Public Lands Center headquartered in Durango, Colo., and the Seventh Generation Institute in Santa Fe, N.M.
"It is good news that pikas are doing better in the Southern Rocky Mountains than some other places," said Erb. "It is likely that the geographic traits of the Rockies are a big reason why we are not seeing significant declines, at least not yet." The ABSOLUTE OUTRAGE I feel reading this article stems from the knowledge that we in North America are forcing the most adorable, super cute and chirpy (meaning personality loaded to human ears) little beast living amongst us to struggle for survival as the climate warms while we stupidly continue to adopt foreign (YES FOREIGN beasts like hamsters and Eurotrash rabbits, fat tailed rats, hedgehogs) as our pets de rigueur. Animal loving Americans MUST UNITE and demand that laws that prevent ownership and proper domestication of a variety of so called "native wildlife" be repealed. The Pika along with the Channel Island Fox (gets no larger than 2-4lbs MAX) and dwarf domestic rabbit (less than 1lb MAX) are prime candidates that would likely adapt to domestication in a few generations, yet idiotic environmentalists pursuing their own faith-like driven agenda fight any attempt to make domestication the common sense solution to animals like this facing extinction.